Figure A5. 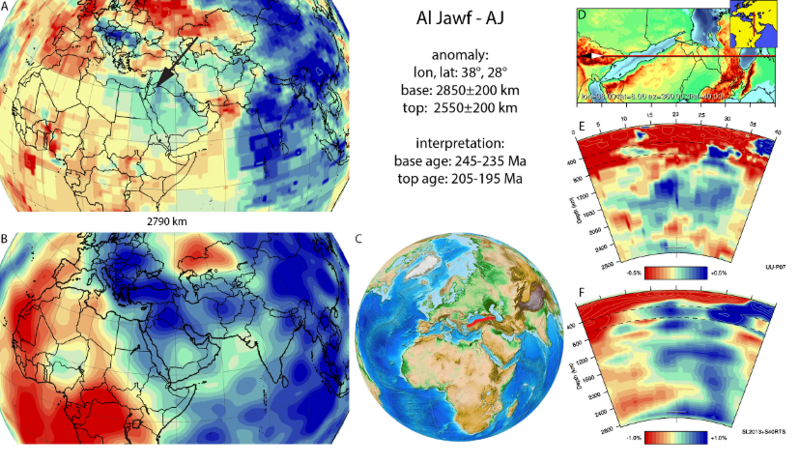 Al Jawf anomaly, interpreted as the Al Jawf slab, with (horizontal) [vertical] cross sections through (A)[D] the UUP07 p-wave) and (B)[D] the combined SL2013 and S40RTS s-wave models at 2290 km; C) the location of the modern geological record that we interpret to have formed during the subduction of the slab. A NW-SE elongated anomaly is imaged overlying the core-mantle boundary below the Red Sea and most of Arabia, which we here define for the first time as the Al Jawf anomaly (Figure A5). Resolution tests show that the anomaly is poorly resolved, and our interpretation is therefore tentative. In the west, the body reached shallower depths, rising up to ~2400 km depth into the lower mantle. Based on correlation with the shallower Emporios slab, the Mesopotamia slab towards the North, the Central China slab and the Mongol-Kazakh slab at similar depths to the NE, we infer the Al Jawf slab likely formed by subduction to the south of Laurasia in pre-middle Jurassic time. We consequently interpret this anomaly as Paleotethys lithosphere that subducted during the opening of the Neotethys between the Gondwana-derived ‘Cimmerian’ continental fragments and Arabia-Africa. Neotethys opening and Paleotethys subduction is not the same age in the Tethyan realm. Between the Cimmerian continents of Iran and Arabia is paleomagnetically and stratigraphically constrained to occur between the Late Permian and the Early Triassic collision of the Iranian Cimmerian continents with Eurasia, 230±10 Ma (Stampfli and Borel, 2002; Muttoni et al., 2009). Closure of the Paleotethys in the Eastern Mediterranean region was younger, and may either have occurred by northward (Okay and Nikishin, 2015), or, as more widely accepted, southward subduction (Sengör and Yilmaz, 1981; Dokuz et al., 2017) below the Sakarya continental fragment. A record of subduction of is reflected by the Karakaya mélange complex in northern Turkey. This complex contains Devonian radiolarian cherts, showing that Paleozoic oceanic crust was consumed (Okay et al., 2011). 40Ar/39Ar ages of eclogite blocks in the Karakaya subduction mélange of 215-203 Ma (Okay and Monié, 1997; Okay et al., 2002) show that subduction was active until the latest Triassic. This mélange is unconformably overlain by Lower Jurassic limestones which may mark the end of subduction around ~200 Ma (see Sayıt and Göncüoglu, 2013 for a review). In addition, Middle Jurassic, ~170 Ma old lavas in the Pontides were interpreted to reflect Paleotethys slab break-off (Dokuz et al., 2017) and we adopt a 200-170 Ma age for the top of the Al Jawf slab. Since there was minimal convergence between Gondwana and Laurasia in the Triassic, the closure of the Paleotethys was almost entirely accommodated by contemporaneous opening of the Neotethys (Gutiérrez-Alonso et al., 2008). The oldest radiolarian cherts obtained from mélanges that formed during subduction of the Neotethys in Turkey along the Izmir-Ankara suture zone are Ladinian-Carnian in age (242-228 Ma) (Tekin et al., 2002; Tekin and Göncüoğlu, 2007) provide a minimum age for opening of the Neotethys and thus for the onset of subduction of the Paleotethys. Because shallower slabs in the mantle in the region of the Al Jawf slab were all correlated to Jurassic and younger geological records, we correlate the Al Jawf slab to the youngest, Triassic-Jurassic record of Paleotethys subduction in the eastern Mediterranean region and therefore adopt a minimum age of 240 Ma for the base of the western end of the Al Jawf anomaly, and a 200 Ma age for the top. The S-wave tomographic images suggest that to the east, there may be more lithosphere present that may be the relics of the Permo-Triassic slabs of the Paleotethys that formed east of the Al Jawf slab, but in the UU-P07 model, we find no sufficient resolution to independently confirm this.